Posted on Mon, Mar 12, 2012 : 7:50 p.m. 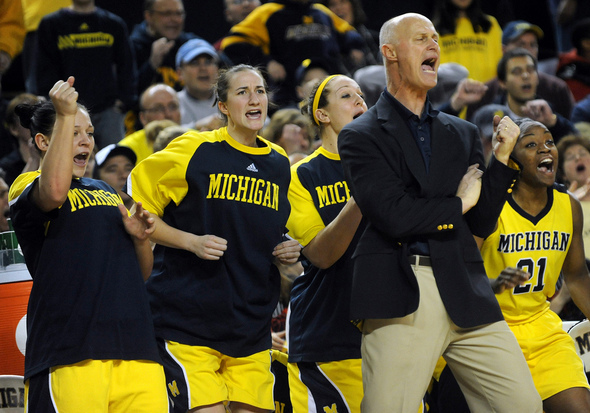 The Michigan women's basketball team is part of the NCAA Tournament appearance since 2001. Eastern Michigan also earned an automatic bid by winning the Mid-American Conference tournament. 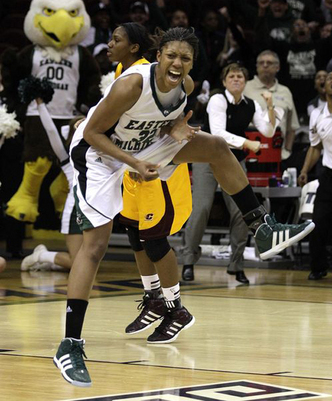 The Eastern Michigan women's basketball team knew its name would flash across the television screen Monday night. The Michigan women's basketball team hoped for the same during the NCAA Tournament selection show. The Washtenaw County programs went 2-for-2. Eastern Michigan's Paige Redditt celebrates her game-winning shot in the MAC Tournament championship game, which earned the Eagles a spot in the NCAA Tournament. "When our name came on that screen, the room just exploded," said Michigan coach Kevin Borseth, who watched the program with his team in the William Davidson Player Development Center. Borseth called the reaction to the program's first NCAA appearance since 2001 "an explosion of happiness and tears and everything that goes with it." A video posted by MGoBlue.com shows the celebration. The Wolverines (20-11) are a No. 11 seed and will play against first- and second-round host Oklahoma, a No. 6 seed, on Sunday (7:35 p.m., ESPN2). No. 3 St. John's and No. 14 Creighton will also play at the Lloyd Noble Center in Norman, Okla.
Eastern Michigan was one of 31 teams that earned an automatic bid to the tournament by winning the Mid-American Conference Tournament title over the weekend. The Eagles (23-8) are a No. 12 seed and will play No. 5 South Carolina on Saturday (11:05 a.m., ESPN2) in West Lafayette, Ind. Host Purdue (No. 4) and No. 13 South Dakota State are on the other side of the bracket. EMU coach AnnMarie Gilbert, who gathered with her team at Buffalo Wild Wings in Ypsilanti to watch the selection show, said she was pleasantly surprised with a No. 12 seed. She had penciled her team in as a No. 13 or No. 14 seed, and even predicted in the Eagles' opponent. She spent time Monday watching film of Georgia. That time wasn't wasted, however, since the Bulldogs were playing Southeastern Conference rival South Carolina. Gilbert was even pleased about the tournament placing the Eagles in West Lafayette. "We’re really excited just to get out of this area," she told EMUEagles.com. "They didn’t send us to the Bowling Green region. We wanted to get our kids out, let them see a Big Ten school and play in a bigger atmosphere and arena. I’m really thrilled for them." Michigan and Eastern Michigan are both in the Raleigh Regional, but wouldn't meet until the Elite Eight. Michigan State gives the state a third team. The seventh-seeded Spartans will play No. 10 Louisville on Saturday in a College Park, Md. Michigan entered the selection process as a classic "bubble" team, and the stress of that scenario followed the team since it was eliminated from the Big Ten Tournament 10 days ago. "It's a hard thing not to think about. It consumes every second of the day," Borseth said. "Probably the only time we got any relief at all was when we were out on the court in practice. ... Prior to that, I think everybody had pretty much had that pit in their stomach wondering what, when, where, why, the whole nine yards." The Wolverines were right to be concerned. They were one of the last four teams selected for the 33 available at-large berths, committee chairman Greg Christopher told ESPN after the brackets were revealed. It's the first time the committee has released its "last four in" and "last four out." Michigan, Florida, Kansas and Texas earned bids because each had no less than four wins against teams in the tournament and had multiple wins over top 50 teams. Oklahoma State, USC, Temple and Virginia were left on the wrong side of the bubble. Carmen Reynolds and Courtney Boylan -- part of Borseth's first recruiting class at Michigan -- both said they were thrilled to see the program take the next step in its building process in their senior seasons. Once their emotions were under control, of course. Reynolds said she "immediately started crying" when she saw Michigan splash across the television screen. "Our program has changed so much since Coach Borseth came here," Boylan said. "To be able to kind of leave our footprint on the program means a lot to us." Rich Rezler covers sports for AnnArbor.com. Contact him at richrezler@annarbor.com or 734-623-2553. Tue, Mar 13, 2012 : 7:28 p.m. I am relieved to see the Michigan women in this year. That was hard seeing them get &quot;oh-so-close&quot; for two straight years, so it's nice for them to get in this time. First time in fourteen years the Michigan men's and women's basketball teams are Dancing in the same year! Make it count Blue! Tue, Mar 13, 2012 : 2:36 p.m.
Borseth and staff have done a great job building this program... they have gotten 2 of the 20 win seasons out of 4 total in history in just 4 years... progressed from bottom of Big Ten to upper half, went from sitting home in March to WNIT and now NCAA bid. They did it with poor facilities for recruiting until this year and tough academic standards that eliminate some top athletes. The win with class, hard work, and kids with great character that know how to play the game. Moreover, while Borseth is always animated and passionate about his team, he has tempered it and represents U of M well. His staff , specifically Coach Plitzuweit are hard working and dedicated to a fault to the program and kids! It is time that Brandon step up and give Borseth the long term contract that that is due and it would be nice to give more than a one year contract to the assistants too. Other programs that want to succeed like Michigan is have taken notice and WILL pluck the coach's out of here. The program will grow to the next level when the coach's and players are given security and stability.... Brandon you did a nice job stepping up on facility upgrades now take care of the people that are doing the work! Tue, Mar 13, 2012 : 12:39 p.m.
these kids REALLY deserved to have something good happen for their program. the video that rich mentions on mgoblue is worth viewing to help appreciate the pure joy. Tue, Mar 13, 2012 : 12:26 p.m.
Coach Borseth, his coaches and staff and more importantly the players, earned the right to have their tickets punched for the &quot;dance&quot;. First, Michigan didn't have enough wins to get in. Then it wasn't enought quality wins. Then it was late loses. But this year Michigan's women basketball program played top teams early, out of conference, doing what the NCAA said it needed to do. Yes, Michigan's women's team lost some games late in the season they should have won, but almost everybody loses late since only conference champions win them all late in the season. Now, coaches and team, go win some tounament games. Why bother getting dress up for the dance if you don't plan on looking good out on the floor? They are Michigan! This is Michigan! Go Blue!